With their launch in 2005 at SakuraCon in Seattle, WA, Maxx Merch has become one of the most popular product lines sold at conventions across America, with intend on exhibiting at the 8th Annual Carolina Games Summit. To promote this exciting addition to the event a free Assassin?s Creed prize pack will be given away via re-tweet contest @cgsummit. * Winner should contact info@carolinagamessummit.com with shirt size selection. S ? 2XL, standard unisex sizes. 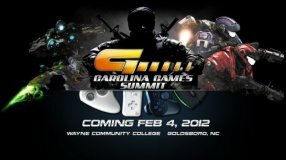 Attendees and past competitors can register online now at www.CarolinaGamesSummit.com for just $10 per player, this price also includes full access to all the speakers, exhibitors, and excitement Carolina Games Summit has to offer.